This is a guest post by Shannen Doherty, who is a technical content writer. In her free time she writes articles related to: internet, AT&T, technology mobile broadband, etc. It seems that Android has already won over your hearts and minds. I wouldn’t blame you. The recent Android tablet integration is also a smart move. However, it seems that a new competitor is coming into the market. Microsoft has been trying to get their tablet PCs out for some time but have not been really successful – until now that is.The decision to ship Windows 8 with tablet PCs is a decision that will prove to be quite advantageous for Microsoft. There are quite a number of reasons why Windows 8 has been put onto tablets. Today’s market has shifted towards portability and integration. You probably own a smartphone or an Android tablet. Although Microsoft previously tried to push their tablet PCs, it seemed that the market was not ready for the trend. However, with the market as it is, the time is right to push a Windows operating system onto tablets. This could possibly give them an edge over Android Tablets. The prices of tablets are lower than that of netbooks. What’s interesting is that a netbook is usually priced a little above a tablet. According to Microsoft, Windows 8 tablets will start at £126($200 or 9ooo Indian rupees); a price significantly lower than Android tablets with similar features and power. Furthermore, Windows PCs have always been cheaper than many other brands out there. It seems that their tablets will be no exception. With similar features at a reduced price, wouldn’t you be cooing to have one? It seems that Windows has a real edge over Android tablets in the price department. It does not matter how old or young you are, you all know about Microsoft and have probably used one of their products at one time or another. Their name could give them quite an edge against Android tablets. I mean, we all know Microsoft to be the most stable software developers out there; especially when it comes to operating systems. A good majority of you have probably switched over to Android-powered smartphones and know their interface well. However, it seems that the interface of an Android-powered smartphone or tablet is not as familiar as that of Windows. The user interface of a Windows operating system is exceptionally well known. Windows has and probably will continue to dominate the PC market. Every one of you is familiar with the Windows interface – you are probably using it right now. To make the switch from PC to a Windows 8-powered tablet is almost effortless. It will take almost no time for you to adapt to the new interface. One of the most demanding aspects of consumer electronics is expandability. It refers to the extra options that can be used with the original device. Wireless internet through dongle connectivity, from providers such as AT&T also counts as an expansion. For example, many can connect a separate monitor, mouse, keyboard and gamepad with their current laptop. Perhaps the docking, charging and streaming stations of many Apple products will serve as a better example. With Windows 8 tablets, you can do EXACTLY the same. Practically any expandability options that could be used with previous Microsoft products can be used with Windows 8 tablets. I mean you could take your tablet and use its touch interface all day and a PC-like device when you come home. This could actually force Android tablets to come up with their own line of expansions. However, it does not seem likely that they will overtake Windows. With the Windows 8 tablets, you have a variety of input options. The integration of such input options are so great that concept may just replace netbooks, notebooks and laptops altogether. A simple £32 ($50 or 2250 in rupees) keyboard and mouse can be synced with the tablet. You can use it as a tablet when you are out of the house and you can use it as your PC (with a keyboard and mouse) when you come home. Windows 8 is optimized for both touch and the normal keyboard and mouse combination.With the option of connecting various peripherals with the tablet, you can use Windows 8 however you want to without compromising on the experience. It seems that Microsoft has made a bold and wise move jumping onto the tablet bandwagon. Windows 8 tablets, when released, will probably have many advantages over Android tablets. For Android tablets to survive, they may just need to pull a bunny out of their hats – so to speak. So do you think Windows 8 has the power & the potential to capture the tablet market share ? She is a technical content writer & is associated with many technology and designing communities including Broadband Expert as their freelance writer and adviser. Prev PostShould I Quit my Job to Become a Pro Blogger? I too prefer Windows over Android, it got many reasons to explain. Coming to brand power, Android being owned by Google, its equal to Windows. Anyhow, we have to wait and see how windows8 tablets will take over Android tablets, btw nice article Doherty. I have been hearing good things about Windows 8 and tablets. The one thing that Microsoft will have going for itself is that they will only need to support one operating system across all platforms – desktop, laptops, and mobile devices. This should allow people to integrate and share their work with all their devices, which is something Apple has done well. I’ll have to wait and see what people say once Windows 8 is released, and by that time I may be ready to switch. That is a great price and I would get one over the other options available at the moment. Hi Shannen, tablets are becoming increasingly popular and I agree with you that Microsoft is wise to get in. 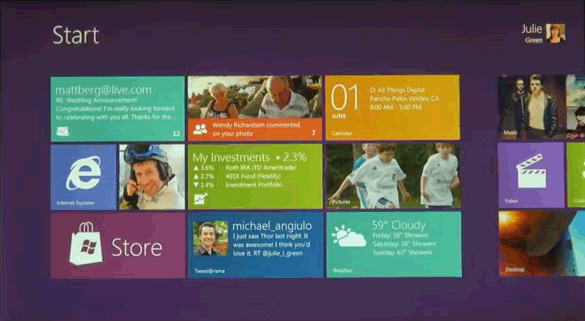 sounds like Windows8 will be a real contender. I tend to believe that those who use tablets are consumers of information and those who will stick with laptops or desktops will be more of the producers of content. any thoughts? I’ve installed Windows 8 consumer preview in my laptop. And I can see it’s much more different and better than Android OS. windows is use to use and since windows announce the price less to it help windows 8 to capture android market. Wow what a great move on Microsoft part. I look forward to checking out their tablet, i am still not satisfied with what is on the market now, and have held off on buying a tablet. Although the market trend is following Android, but Windows shockingly came into notice from Lumia. And personally I think soon Windows will catch the sales of or atleast match up the sales of Anndroid. I’m sure you are right Gaurang, with the three big competitors, Apple, Android and Microsoft the competition will help insure that the quality remains high for us users!